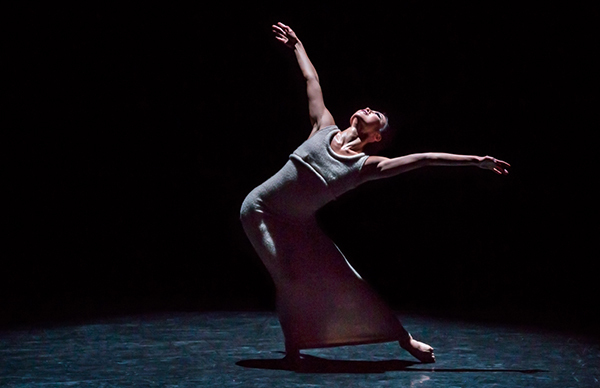 Annenberg Center and NextMove Dance presented The Martha Graham Dance Company last weekend in three performance of selections from The EVE Project comprised of repertory classics, and a premiere excerpt from a new work in progress. Janet Eilber, MGDC’s artistic director is preserving Graham’s repertory for a new generation of dancers, and in ways that make them as relevant as ever. MGDC presents works, old and new, that embody Graham’s vision as ‘the mother of modern dance’ in America. As the company is celebrates its 93rd year and the EVE Project explores Graham’s impact as the leading American choreographer of the 20th century. The EVE Project Annenberg performance opened with Graham’s Diversion of Angels (1948) Graham’s meditation on love, exploring different aspects of relationships- physical, pyschological and emotional. Natalie Diamond Walker is in white, partnered with Ben Schultz, the dance regal couple in the full bloom of new love; So Young An is in Red in scenes with Lloyd Knight highlighted by quicksilver configurations and intricate lifts; Charlotte Landreau in yellow and flying through the with arrow sharp jetes- at one point she hops onto Lloyd Mayor’s shoulder like Arial on a leaf. Laurel Dalley Smith, Marzia Memoli, Anne O’Donnell, Leslie Andrea Williams and Lorenzo Pagano dance around the couples in geometric, cryptic patterns. This is vintage Graham full of ensemble precision and psychosexual musings. Ekstasis, a solo choreographed in 1933, now re-imagined by Virginie Mecene and a new score by Ramon Humet. danced by Ann Souder, in a dress that the befits Graham proverb “The body is a sacred garment.” Souder is a kinetic sculpture in severely angled positions that give way to sinuous isometric postures. Expressive bodyscapes the spellbind as they challenge how one views the female form, erasing male perspective and objectification. Eilber continues to explore the artistic achievements, training and the full scope of Graham’s impact on modern dance worldwide and has collaborated with contemporary choreographers to create works for the company. Closing out the first half of the program and special to the Annenberg performances, the company previewed an excerpt from Deo a work in progress that will have its premiere at the Joyce Theater in April. Co-choreographed by Maxine Doyle and Bobbi Jean Smith, and scored to original music by Leslie Flanagan, Deo is loosely based on the myth of Demeter, Goddess of Harvest and Fertility, and her daughter Persephone, who is abducted by Hades and forced to spend six months every year in the underworld. Some of Graham most celebrated ballets were inspired by Greek mythological characters. After intermission, Graham’s 1936 ballet Chronicle, for the full company of women, proved to be the highlight of this repertory selection of The Eve Project. With its driving cinematic score (in the dated literal/musical narrative sense) by Wallingford Riegger. Chronicle was created in the year when Graham refused an invitation by the Nazis to perform at the 1936 Summer Olympic games in Berlin. Part I- Spectre 1914 – Xing Ying wears the black and red dance gown that flares out and can be sculpted, Ying’s command of both the menace and strife telegraphed in every intricate and hypnotic motion. The evocations of the swirls and shapes of the dress, the red fabric slicing through the air and against her body is a vision of impending dread and carnage. II- Stops in the Street: Devastation-Homelessness-Exile. The oppressed women, in black garments moving over the stage locked in aimless, rigid processionals. Victims of brutal force, as they try to survive being forced to submit to circumstance beyond their control. The single woman walking against the throng, being knocked back. Graham articulates her rage against fascist brutality. The resistance and the will to fight on, even as the body is being demoralized and discarded. III. Prelude to Action- Pledge to the Future– The spirit of resistance is expressed in the final section – the austere ensemble gives way to expression of unity and power, the ensemble is in full motion, dramatically forceful dances of solidarity and enduring humanity. The extended applause for this dance was not only for the technical demands and artistic precision by the ensemble, but you got the sense that it was for the bravery and vision of Martha Graham.